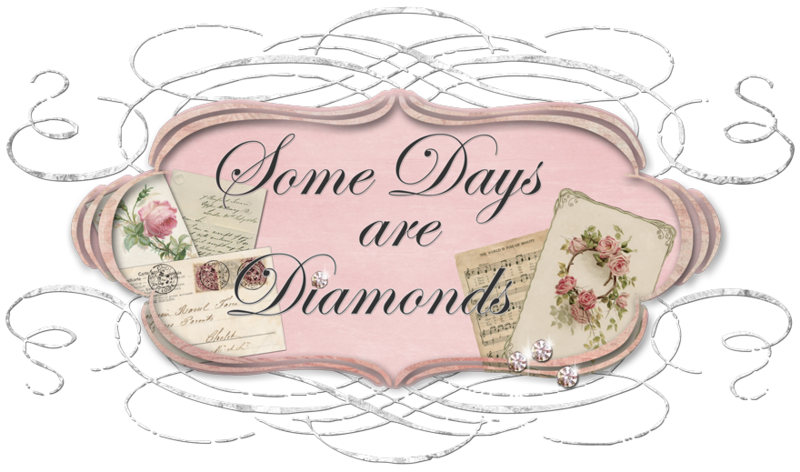 Some Days Are Diamonds: Note to self . . . Sometimes blogging can take on a more personal note - as well we all know. This is one of those times for me. I want to document something I am doing just for me. I have once again discovered that I truly enjoy crafting. This goes way back, even before being Chairman for Christmas Craft Workshop in PTA when my oldest was in first grade. I love working with paper (thus the scrapbooking) found objects, ephemera, natural fibers etc. Occasionally I like to sew, but more often the "stress" in seamstress takes it's toll on me. I love making gift tags (I know - but I DO!) Not so much into cards, but - whatever strikes me at the moment. Loving thinking up new pieces of jewelry, but don't have all the tools necessary to really make what I want. I am REALLY looking forward to learning to solder, and after a wonderful conversation with Bryanna from Polka Dot Parliament last weekend at the craft Soiree I attended, I have ordered what I hope is the perfect tool to get me started on an entire new leg of my newfound journey. So while there are going to be many people who look at this and say "What for?" I will always look at it and remember each and every little bit that I put into it. From where I picked up this piece, or found that piece - remembering the giddy excitement of finding a perfect treasure that I knew I could use someday. So indulge me while I document my latest venture. I have joined an on-line craft course. It is a journal called "A Beautiful Life". It's base is an old book. Our instructor is Heather from Pretty Petals and she is just a SWEETHEART! I am having just the BEST time. I love that it is an on-line class, and I can go "be" and create whenever I have the time or desire. I can re-read instructions, and get inspiration from her words and photos. She supplies us with free downloads of art, be it vintage photos, postcards or sheet music. And I get to scour my studio looking for the perfect pieces to put together. Now unfortunately for me, the book I choose was much smaller than the instructor's. I really only have one larger book and it is my treasured Heidi book and I could not tear it apart. And I was too impatient to wait and go shop for another so used one I already had. So some of the artwork and downloads Heather made available to us, I could not use. Some of it just did not look good on a much smaller page than intended. But that's OK. You can copy her instructions word for word, or go off on your own, and follow the suggested game plan your own way. That's what makes crafting so unique. my vintage wallpaper. Heather told us to use things we love. this journal. I want it to be special and meaningful to me. From the photo you cannot tell but my ribbon is sage green also. Page 3 - I LOVE the picture of the woman she provided us with . . .
buttons, pearls - whatever we desired. Heather gave us complete instructions. vintage hat I found in Nebraska that my rat of a dog Jorja ate. Page 4 - "Oh how I love..." Sampler pages. intended to show the quality, style, or nature of the whole"
because I wanted the pages to be about them, not the background. The card with the bird in the nest you see below is a vintage Victorian calling card. I found an antique dealer who had several of these and I snatched them up. This is only a scanned image - I didn't have the courage to use the original. (I know - I hear you - "chicken".) I need to get past that . . .
buttons of my Mom's. It is GORGEOUS! The brass "finding" below is one I found in Paso Robles. This lovely woman is a reproduction Victorian card. The detail of her is just wonderful! Look - there is even a street scene depicted on the fan. Well, I'm all caught up. :( I can't wait for the next pages! Have a wonderful, peaceful and relaxing Sunday. There is so much stress in society nowadays, with raising kids, the economy, work, chores . . . it is nice to find a quiet outlet such as this. I hope each of you has found some special way to just "be". Oh this is beautiful! You didn't do this just for you -- we've really enjoyed it too! One can tell by the way you describe every little piece how much you love this. It's a real treasure you have made with all your love. I hope you will have a granddaughter one day to share this with ! You have created a real work of art...I just love it!!! I love that you are persuing your passions...that is one of the things that makes life great...I say BRAVO!!! Oh my, what a beautiful creation! It is just precious... wish I could sit still long enough to create such beauty:) Have a blessed week! WOW!!! How beautiful! What wonderful work! So glad "self" is taking time to create and craft. It is such a wonderful outlet isn't it. Youve done such a beautiful job. You've inspired me! I've got to carve out a space to do some crafting. Right now I can't get to my supplies becuase the hamster cage got set up in front of my cabinet, and a love is seat pushed up against the built in drawers. The tables in "my" room are filled with playdough and video games. ugh! Hi Karen! Oh, this is so pretty! I'm so glad you're able to do something that pleases you so. I love paper too and love to scrapbook but because of circucmstances, haven't been able to scrap for almost two years! Hopefully I can get back to it soon. Thanks for popping in to see me. Karen this is truly gorgeous and heartwarming. What a special book to create ansd cherish! It's beautiful! would all come off this quickly. Sigh...I'm down to a snails pace with only one more pound lost this week. Shucks....:) I'll keep puggin' along though. You're doing awesome yourself my friend. Way to go! Karen, you are so creative and talented. Glad you are doing something for yourself that you enjoy so much. It seems like everything you do turns out so great!! oh my GOODness Karen!!! I LOVE your pages so far. you have done such a wonderful job of taking the images and instructions and twisting them to make your journal special to you! I love the beautiful roses behind the girl... that looks so pretty. And those little pearls... such a cute little addition. Such a wonderful post! OH and I love the sampler page too... how sweet you used your Moms button. Stephenie is using a smaller book too and mentioned that some things have to be adjusted for scale on hers too. Karen, your art journal is beautiful!!! i like that you are going your own way with the pages...it makes the pages more meaningful to you...i kind of stayed with Heather's game plan on the first set of pages...but then i started doing my own thing using some of her images...i think that is SO sweet that you have one of your mom's buttons on your sampler page!!! Your book is just gorgeous.. I love each and every page.. You've added so many beautiful details... You go girl!!! You are so creative and talented Karen! I admire people w/ artistic talent - especially when they share it w/ the rest of the world. I love the victorian lady too - it all looks lovely! Karen, I LOVE your pages so far...especially the one of the lady in the hat. Love what you did with the wallpaper, lace, pearls, and...is that glitter too? It just all works so well together. And you're not chicken! You are doing a lot of your own thing, that makes you brave. I'm the chicken, sticking pretty close to Heather's original design because I'm afraid I'll screw it up if left to my own devices lol. Can't wait to see your next pages! it's beautiful. you did a great job. I, too, can recall just where I picked up each and every little bit, piece, bauble and doo~dad. They all have a use. We girls are funny that way! I am intrigued now about this workshop .. must go and check it out. And thanks for your kind comments. I have seen quite a few of these gorgeous books from Heather's class...yours is beautiful! Isn't crafting fun? I have always loved it. Karen, Your journal is beautiful! I love all the little unique touches you've added. Like the button from your mom, the lady from the vintage card, your 'special' vintage wallpaper. Awww, it's so very pretty!! :) I also love that you've used very special bits in yours! Such a beautiful creation, full of personal meaning for you, is worth all the original buttons and cards you choose to add! Although I've finished only my journal cover so far, I've also added pearls. It tickles me to see that you did, too. Isn't this a wonderfully adaptable project? Wow Karen, your pages are beautiful!!! I love all of your little details...so pretty! It really sounds like you are having so much fun. I love visiting others who are doing the same book...they are all gorgeous. Heather is so sweet and I'm sure this is a wonderful course! I hope that the next one she gives, I won't be crazy busy!!! I wish I was playing with ya'll too. I'm finally catching up on blogs this weekend...sorry I haven't visited lately. I sure miss you and I'm so happy you won all of those goodies! You lucky girl. I had to laugh when I read how your little Halloween trick or treaters come "bussed in"...it's so true here too. I can't wait to see what Hallloween tips you have for us...Yay!!!! I found you through Heather's (I just started my journal) and I'm loving strolling through your blog.